Universal, four-in-one adapter accepts traditional Uncle Mike’s style sling swivels, quick-release push-button swivels, H&K-style clip-on swivels, or simply thread your sling through the 1" wide loop. Eliminates the need to change sling adapters to match different style sling swivels. 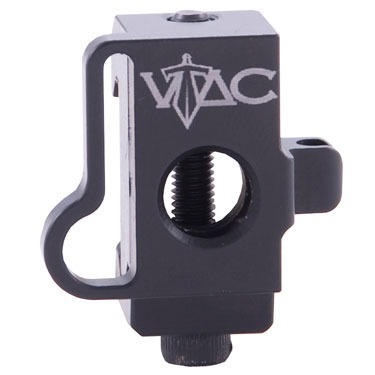 Lightweight aluminum clamping block with single cross-bolt locks mount securely to any Picatinny or Weaver-style rail. Quick-release push-button swivels, when installed, are limited to 45° rotation to help prevent sling twist. SPECS: 6061 aluminum, hardcoat anodized, black. 15⁄16" (3.3cm) long x 11⁄8" (2.9cm) wide.